Recipes - Entrees - Balsamic Brown Butter Stuffed Ravioloi - Salado Olive Oil Co.
Bring a large pot of water to a boil. Make sure to salt the water. Add the ravioli and cook 4 to 5 minutes, until tender but still firm to the bite, stirring occasionally. Drain the ravioli. In a medium saucepan cook the butter over medium heat, stirring occasionally until the butter begins to turn a golden brown, about 3 minutes, turn off the heat. Let cool for about 1 minute. Stir in the balsamic vinegar, salt, and pepper. 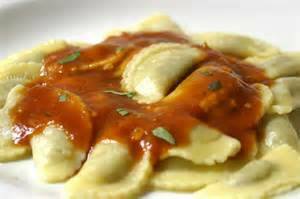 Transfer the ravioli to the pan saucepan with the balsamic brown butter sauce. Sprinkle with your choice of nuts and Parmesan over the top. Serve immediately.